Eaton 2-Pole Heavy-duty 22.5-mm contact block has contact rating of 10-Amps at 600-Volt AC and 2.5-Amps at 600-Volt DC. It has 1 NO - 1 NC contact configuration. This corrosion-resistant contact block has screw connection. It has glass filled nylon construction and silver contact for enhanced conductivity. 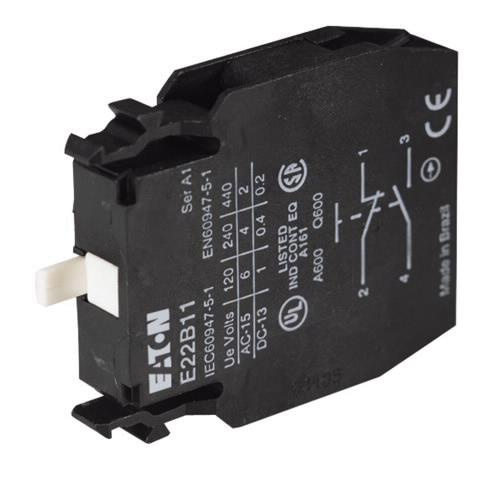 This standard water-tight/oil-tight contact block has IP65/IP20 protection. It measures 1.5-Inch x 1.5-Inch x 5-Inch. It withstands operating temperature range of -20 to 60 deg C and storage temperature range of -40 to 80 deg C. Contact block is UL listed, CE/CSA certified and NEMA 1/2/3/3R/4/4X/12/13 rated.